Ischemic Myelopathy in dogs is a vascular disease of the spinal cord (myelopathy) caused by a lack of its blood supply (ischemia). What is an Ischemic Myelopathy? Like any other organ, the spinal cord critically relies on a permanent blood supply to bring nutrients necessary for its proper function and remove waste products. Arteries supply defined segments on each side and all along the spinal cord. Blockage of one of these arteries results in a sudden switch off of the portion of the spinal cord fed by this precise artery. Although many unusual causes of blockage have been recognised (fragment of tumour, fat), the most common nature of this blockage is a fibrocartilaginous fragment of the intervertebral disc (hence the term Fibrocartilaginous Embolism is often used instead of Ischemic Myelopathy). Despite many suggested theories, how and why this fragment of intervertebral disc suddenly gets into the spinal cord artery remains unknown. 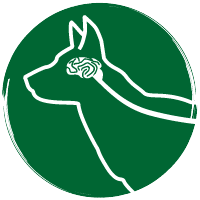 What are the signs of Ischemic Myelopathy in dogs ? Ischemic Myelopathy is a common cause of acute paralysis in dogs (particularly large and giant breeds of dogs). It is occasionally seen in cats. Depending upon which portion of spinal cord is affected, and whether only one side or both sides are affected by the lack of blood supply, this condition can cause paralysis of one back limb, both back limbs, all four limbs or only one side of the body. Typically, this paralysis has a sudden onset, does not cause any pain and does not worsen with time (at least after the first 24 hours). Spinal cord contusion (“spinal cord bruising”) caused by a road traffic accident or a bad fall. How is Ischemic Myelopathy diagnosed? A diagnosis of Ischemic Myelopathy in dogs often results from the exclusion of other causes of acute paralysis (see above). For this purpose, diagnostic tests such as spinal radiographs, myelography and/or an MRI scan (see Neuro-Diagnostic tests Fact Sheet) are required to rule out conditions causing pressure on the spinal cord (such as intervertebral disc herniation or spinal fracture/dislocation) that might necessitate surgical treatment. In the majority of animals, these tests will typically return normal results in cases of Ischemic Myelopathy. It is therefore fundamental that the correct portion of the spinal cord is checked before any conclusions can be drawn on the absence of abnormality via myelography or MRI scans. Occasionally swelling of the spinal cord can be detected via myelography or MRI scans. A definitive diagnosis of Ischemic Myelopathy and identification of its exact cause can only be made by post-mortem examination of the spinal cord. Can you treat Ischemic Myelopathy? There is no specific treatment for Ischemic Myelopathy. Nursing care (for example physiotherapy, assisted walking, hydrotherapy, adequate bedding to prevent bed sores) is essential for the recovery of the animal. What is the prognosis for Ischemic Myelopathy? Although there is no specific treatment for Ischemic Myelopathy, most dogs tend to recover within a few weeks providing that they have retained the ability to feel pain in their feet. In cases of complete paralysis, improvement may not be seen for a couple of weeks and some animals may not fully recover. If you are concerned about the health of your pet you should contact your veterinary surgeon.